The next morning I go for a few rounds around the ship’s jogging track and reward myself for this accomplishment with three breakfasts on the ship’s Lido buffet deck. 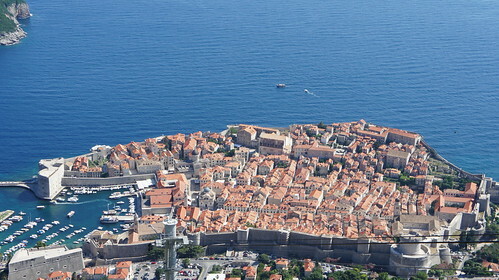 Today we visit our first port of call: Dubrovnik — an old medieval walled town on the Dalmatian coast, now one of Croatia’s most popular summer destinations. 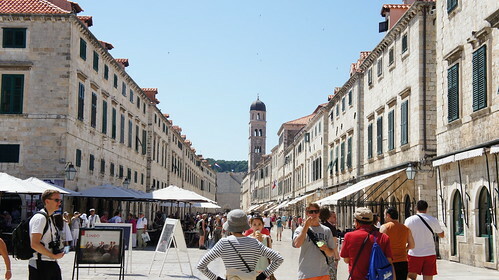 The ship docks at port of Gruz at 1PM as we finish lunch, and we avail of the cruise line’s shuttle bus service to Old Town, entering through the Pile Gate. 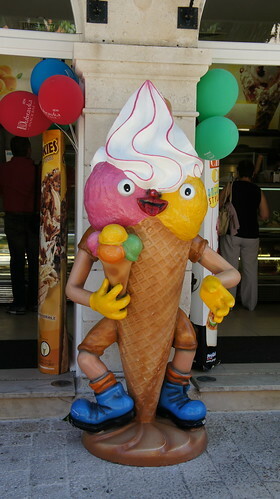 We are greeted by Saint Blaise and a scary gelato mascot. 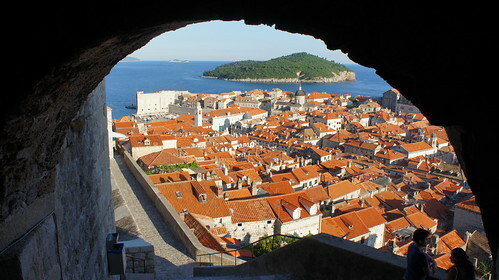 Once inside we walk down Dubrovnik’s main street, Stradun, clear to the other side of the old town (it only takes a few minutes) and out onto the old pier. 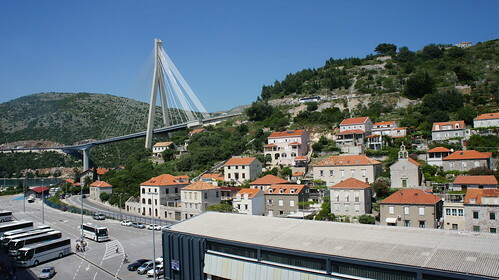 After a few photos we backtrack into old town to hunt for the exit which leads to the Dubrovnik cable car station. 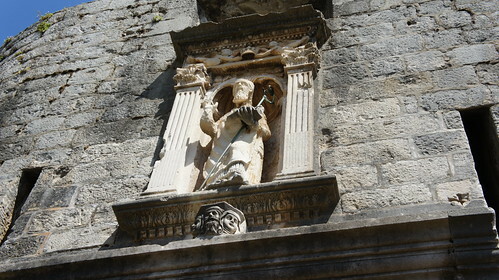 En route, we stop by the Dominican Monastery, whose building serves as a museum for Croatian artists and old reliquaries. In addition to various paintings we find a reliquary purporting to contain the skull of St. Thomas the Apostle. Somehow I doubt it. 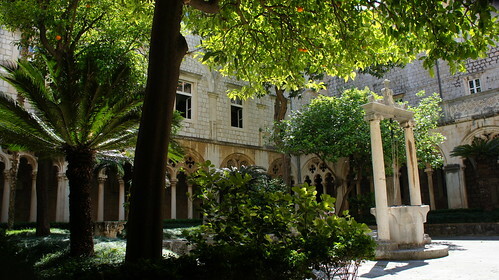 No photography allowed in the galleries, but the courtyard and apse are lovely. 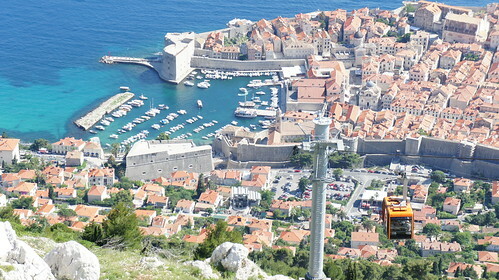 Another gate out of the old town, and a few stairs and switchbacks, and soon we are at the Dubrovnik Cable Car terminal. Bit of a wait for the cable car (I think they only have one operating in each direction on the cables) but on board it’s a quick ride up the slopes of Srd Mountain. 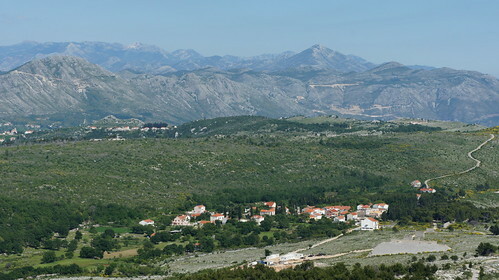 Lovely view from the top, old town in one direction and the craggy Dalmatian mountain range in the other. 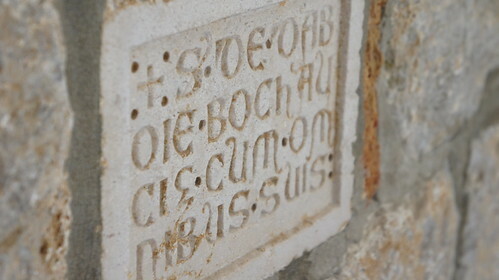 Amy purchases a hammer-stamped souvenir coin for her brother from a classic Croatian coin maker. On the way back down I get some shaky video of the cable car ride descending Mount Srd. Back in the Old Town we wander the alleys a bit in search of a light snack, eventually ducking into a little hole-in-the-wall type of konoba serving flaky Croatian cheese-and-spinach pastries for cheap. 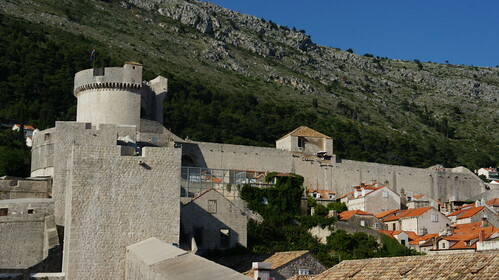 That should be enough to sustain us for what comes next: a full circuit of Dubrovnik’s famous ramparts, starting from our point of entry: the Pile Gate. It takes just under two hours to do a full circuit of the walls, with stops to take in the stunning vistas of town, mountains, and sea. 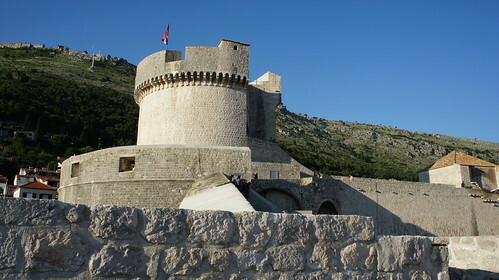 Various forts form nodes at which one can climb to a tower for a view from above, or a view framed by slitted portholes through which archers and gunmen must have once fired on invaders. Having circled the town completely we exit back out the Pile Gate and board the bus back to the ship. For dinner that night we eat in the Grand Pacific, the dining room at ship’s aft decorated in the art deco style of a 1930s Matson ocean liner. It’s the perfect ambience for us, and we have most of our dinners here for the rest of the cruise. We stroll along the promenade deck back to our cabin, and the ship slowly pulls away from the Port of Gruz, and the moon rises over Dubrovnik as we depart. 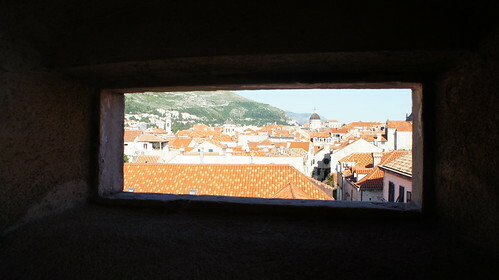 Full Dubrovnik photoset on Flickr.